Bath's popularity exploded during the 18th century requiring the city to expand. However, rather than do so in a random manner, much of the new building was done by two men, John Wood the Elder and his son John Wood the Younger. As a result, Bath has an architectural unity, which is unusual in cities of its size. John Wood the Elder used Palladian style architecture for his new developments. This style was very popular at the time. In addition, with its Roman connections this classical style was very appropriate for Bath. The two best examples of the senior Wood's work are Queens Square and the Circus, a crescent of residential buildings originally conceived of as a sports complex. It fell to John Wood the Younger, however, to design Bath's most famous Georgian development - - the Royal Crescent. 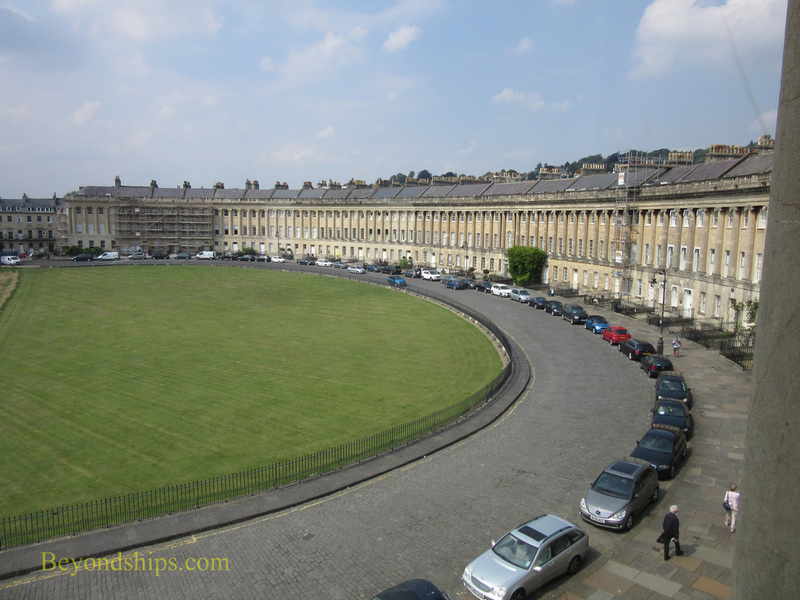 Situated on the crest of a hill overlooking the greenery of Royal Victoria Park, the Royal Crescent is a crescent of 30 houses done in Palladian style. Although the facades are uniform, the houses are actually of different sizes and layout. This is because the original purchasers purchased a length of the facade and then were free to use their own architects to build whatever they liked behind the facade. One of these houses, No. 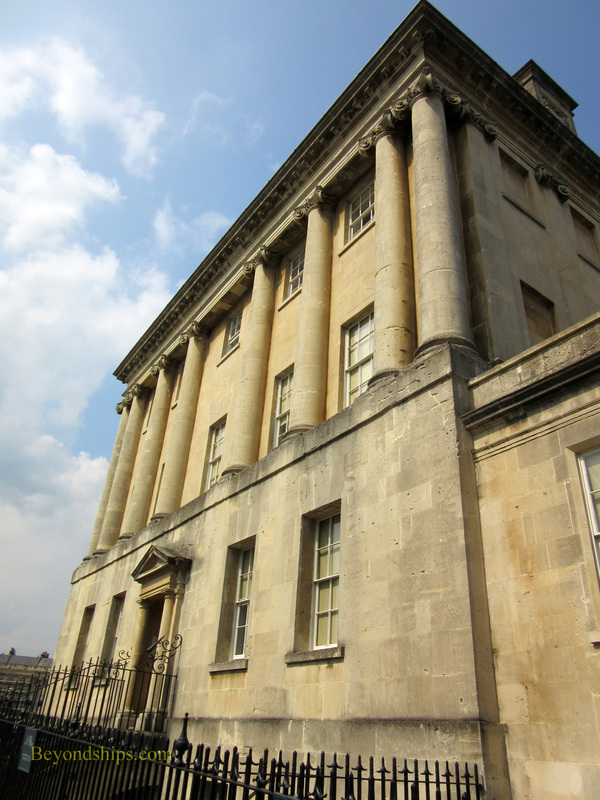 1 Royal Crescent, is now a museum open to the public. Inside visitors get to glimpse what one of these elegant residences looked like during the Georgian age. Built between 1769 and 1769, the house was briefly a royal residence when Prince Frederick, the Duke of York briefly occupied No. 1 during 1776. However, the museum depicts the house when it was lived in by Mr. Henry Sandford, a retired Irish M.P., from 1778 to 1796. No. 1 Royal Crescent is the first building at the eastern end of the crescent. Visitors purchase admission tickets in the information room that is in the neighboring 1A Royal Crescent, which was originally the service wing. To gain admission to the main house, you present your “calling card” (i.e. ticket) at the front door of No. 1 to one of the staff who is dressed in period costume. You are then free to circulate through the house. There are staff members in costume throughout the house as well as placards with information about each room. In some ways, visiting No. 1 is like visiting a stately home. The rooms are full of antiques, paintings and furnishings. The Georgian style is luxurious but elegant. However, No. 1 was a townhouse and thus is more condensed than a massive country mansion of that era. On the ground floor, there is th parlour, the dining room and the gentleman's retreat, where the man of the house could go to indulge his interests and hobbies. On the next floor is the the withdrawing room where ladies could take tea after withdrawing from dinner. Also on this floor is the lady's bedroom, where the lady of the house slept, dressed and sometimes received visitors. Going up the Grand Staircase one more floor, you come to the gentleman's bedroom. Since 2013, the service areas of the house have been open to view. To see them, you take the backstairs all the way down to below street level. Here, you find the servants' hall, the housekeeper's room, the kitchen and the scullery. Yet another set of stairs takes you up into the information area. The shop is also located here. No. 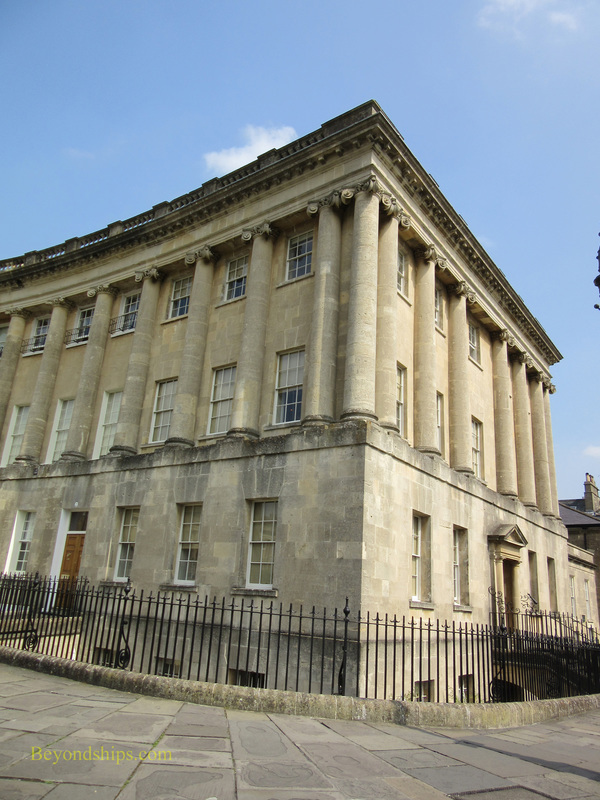 1 Royal Crescent is operated by the Bath Preservation Trust. There is an admission charge. 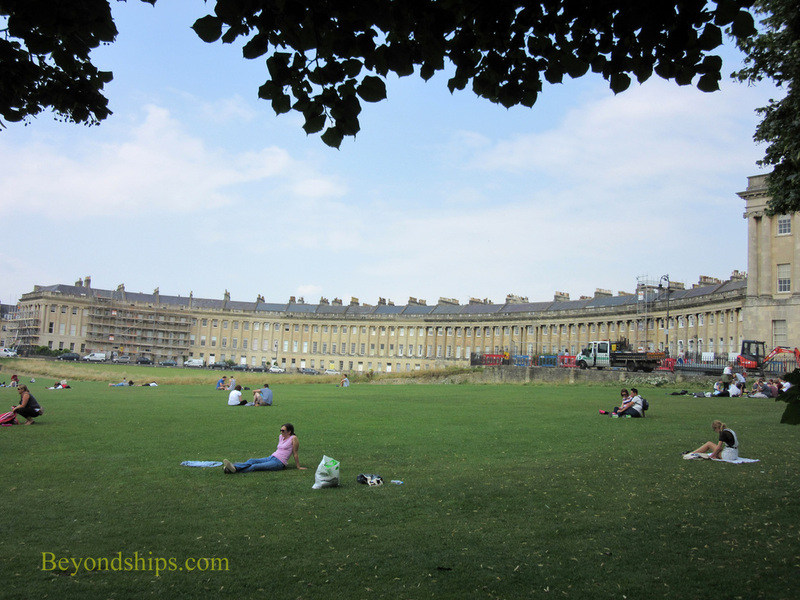 Above: The Royal Crescent from Royal Victoria Park. 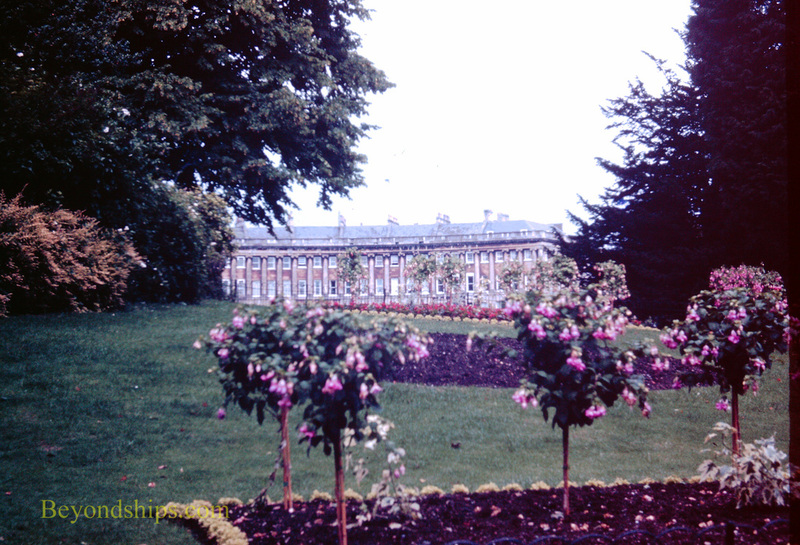 Below: The Royal Crescent from No. 1.